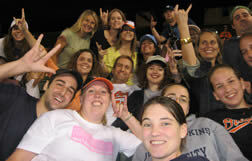 BFHA members and friends enjoy an Orioles game. Of course the Baltimore Field Hockey Association (BFHA) is about playing field hockey. But BFHA also has a strong social aspect; we like to have fun and we want to connect players with one another. 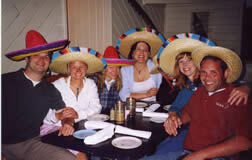 BFHA hosts social events throughout the year, often tied to a particular season of play or an event. Some of the best friends you meet may be through BFHA! Team members kick back and socialize at Beach Bash, an annual tournament sponsored by BFHA. Socials often involve grabbing something to drink or eat and we vary the location so that we try different neighborhoods in the Baltimore area, which reflects the makeup of BFHA members - we have BFHA members that live in downtown Baltimore while others live in the surrounding areas. During Fall League, you can often see BFHA members scrambling out after the day's play to catch the remainder of that Sunday's football games - there is a huge Ravens fan contingent of course, but our members have moved from all of the country and world to Baltimore, so there are some fun team fan rivalries! BFHA also host socials in conjunction with the tournaments we host. At Beach Bash in Rehoboth Beach, DE each April/May, BFHA hosts a Saturday night social for all the teams playing in the tournament. Socials at tournaments are a great chance to get to know fellow club teams in the region. Additionally, many of BFHA's fundraisers offer a social aspect and a chance to get to know your fellow BFHA members; previous fundraisers involved selling Orioles tickets, working Ravens' games, and guest bartending.